Jon Hart restocking the New York Kayak Company's shop at Pier 40. After a sewage plant fire in Harlem discharged wastewater into the Hudson last week, many river activities were suspended until late Thursday. The frontiersmen of the Hudson River, as some like to call themselves, arrived over two decades ago determined to transform the filthy industrial waterway slicked with oily rainbows into an aquatic playground fit for a 21st-century city. Eric Stiller, founder of Manhattan Kayak Company, on a stand-up paddleboard on Wednesday. He said his business had lost as much as $10,000 on what might otherwise have been the busiest week of the year. But after a sewage plant fire in Harlem discharged hundreds of millions of gallons of wastewater into the river last week, New Yorkers may have found a new reason to doubt their long-derided rivers — at the expense of the businesses built on their revival. Until late Thursday, the city had prohibited or strongly discouraged recreational activity on the Hudson, the Harlem River and parts of the East River and the Kill Van Kull. For those who make their living on the water, the sewage discharge has been devastating, landing squarely on one of the hottest weeks of the summer, in the middle of peak business season. Mr. Henriksen was forced to refund several thousand dollars after event and lesson cancellations, he said, and calls for reservations have dropped 80 percent to 90 percent this week. Even nonprofit groups lost income. At the Village Community Boathouse, which hosts free rows three times a week but relies on contributions, a donation barrel stood empty. Customers also fled from businesses that barely dip a toe into the water. The Classic Harbor Line, which charters vintage boats for up to $1,200 an hour, fielded cancellations from clients including patients recovering from heart surgery, who worried about exposure, and groups that thought the Hudson no longer seemed classy. For businesses that helped shape the Hudson’s sunnier image, one question looms larger than lost dollars: Will the latest setback resuscitate old feelings? Spurred by long-term initiatives, like Gov. Nelson A. Rockefeller’s $1 billion Pure Waters Bond Act of 1965 and the federal Clean Water Act of 1972, the river’s reputation has improved in recent years. 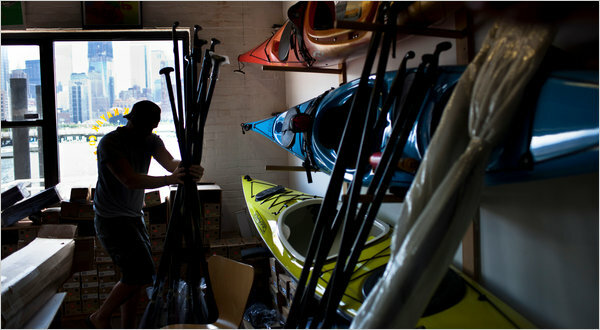 Kayak and canoe businesses have sprouted along Manhattan’s West Side. Renderings of future developments, like Brooklyn Bridge Park, often show boat slips and kayakers just off shore. Children’s camps include river adventures in many of their summer itineraries. More than 200 species of fish thrive in the Hudson. Turtles sun on rocks near the piers. Even seals have been spotted, some paddlers insist. For residents old enough to remember the era of sludge, businesses fear that much of this progress may be discounted.